The essence of Chinese cooking lies in bringing out the natural flavours of ingredients. Knorr Chicken Stock brings out the best flavours of natural ingredients because of its natural chicken umami. Salt, Monosodium glutamate, Maltodextrin, Cornstarch, Sugar, Chicken, Palm Fat, Hydrolysed Vegetable Protein, Sodium Inosinate and Guanylate, Permitted flavourings (contains Egg), Silicon Dioxide and Spices. All food additives used are from plant, animal and synthetic origins. May contain traces of cereals containing gluten, fish, soy, milk, crustaceans, mollusc, peanut and tree nuts. 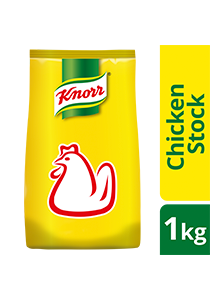 The Meatiest Chicken Powder in the Market, Knorr Chicken Stock is made with quality real chicken meat that adds well-balanced chicken umami and aroma to all your dishes. Perfect for use in stir-fry, soup and marinade. For Stock: Dissolve 20g of Knorr Chicken Stock in 1 liter of boiling water. For Stir Fry: 50g of Knorr Chicken Stock to 1kg of cooked rice. For Marinade: 40g of Knorr Chicken Stock to 1kg of meat.